THE PRINCETON REVIEW GETS RESULTS. 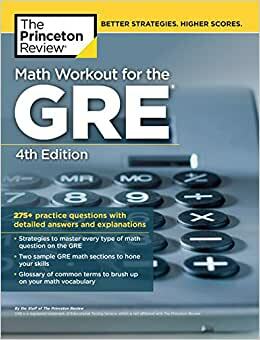 The Princeton Review's Math Workout for the GRE is your one-stop guide to conquering the quantitative portions of the GRE exam—even if your math knowledge is a bit rusty. Inside, you'll find useful reviews of key test topics, strategies for tackling tough questions, and all the practice you need to get the score you want. Overall, a good prep book. They provide many strategies & shortcuts to help solve the problems. Sometimes the explaination are a little wordy and confusing. Also, there are very little resources online (just FYI). good book. really good for someone who is trying to learn the basic rules for math. I just graduated college and it has helped spark my memory. I will agree that the questions in the book are less challenging than the ones in my Kaplan book but that could’ve been due to not knowing the rules that Kaplan doesn’t quite explain well. I would still do loren online and book prep! Good math practice for the gre. I haven’t taken ,ath in over 40 years and I was going to go to school in Georgia and the gre is amusr, but I’m going to another school instead and I’m accepted in a dual masters program and I’m doing great. Really like this book; it breaks down the questions step-by-step, even the practice quiz questions. Easy to follow and understand.